When you hear the words “hair transplant”, what comes to mind? Islands of big chunky hair plugs dotting a mostly-bald scalp? Good news: Times have changed! 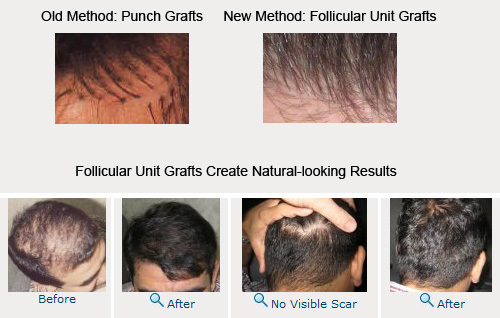 Outdated “punch grafts” have been replaced with “follicular unit grafts.” Follicular unit grafts maintain their existing anatomy. They are transplanted from the sides and back of the scalp because this hair is genetically encoded to grow throughout life.1 So hair restoration surgery utilizes your own genetics to produce success. Hair from the sides and back of the scalp is growing perpetually, so it is used as a donor region for hair restoration surgery. But what happens to the donor area? With new techniques, the donor area is enclosed and surrounding hair covers the site completely, usually leaving the surgery undetectable even immediately after a procedure. For most people, this transplanted hair never falls out. Hair transplantation is usually a permanent solution for hair loss and balding. What does this technique entail? The latest technology is based on specific anatomic units that are called follicular units. Follicular units are the natural groupings of the hair, the way it normally grows. Follicular units consist of: one to four or rarely five terminal or mature hairs, one or two vellus-fine hairs, a blood vessel and a discrete nerve supply, a sheath of connective tissue, sebaceous glands, and the erector pili, a tiny muscle. This method creates the most undetectable result and makes it easy for the surgeon to following the natural angles of emergence from the scalp. The angles a which hairs exit the skin varies widely. This is important because there is variance of these angles depending on a particular area of the scalp. More blood and oxygen circulate to the hairs in the graft, which results in improved survival over older methods. The incision is smaller; thus, it heals more quickly and establishes a nourishing local blood supply to the grafts.The older “plug” techniques created scarring and impaired the flow of blood under the scalp. Follicular unit grafts utilize very tiny slits; therefore, minimal tissue is subjected to scarring, and other complications are rare. Dr. Larry Shapiro, with hair transplant Miami and hair transplant Boca Raton clinics, is one of the few pioneers of the ultra refined follicular units, which involves further dissection of the fatty tissue around the hair follicles for very natural results. How long does this procedure take? Many short sessions can impact the patient’s schedule.Dr. Larry Shapiro, a dermatologist and hair transplant surgeon, typically recommends starting with 3- to 5-hour follicle unit transplant session. “We cannot guarantee one sitting, but many patients are satisfied with one sitting, which typically creates a natural, undetectable result,” said Dr. Shapiro. With 20 years of experience, he has performed more than 11,000 hair transplant surgeries in South Florida. “Even with further hair loss, this transplant can stand on its own.” Additional sittings are needed if a patient loses more existing hair and wants to replace it, or wants additional density. Patients may also want to change or lower a hairline. “We have an extremely efficient and expedient process,” said Dr. Shapiro. This technique can match the orientation of surrounding hair follicles. When follicular unit grafts are performed correctly, the cosmetic results of contemporary hair transplantation are virtually undetectable in women and men.2 Other solutions may slow hair loss, however, this is a permanent solution. Patients and physicians alike are pleased with the results of contemporary hair transplantation, and physicians can now recommend the procedure without reservation. If you have already had hairline loss, hair transplants are a safe and permanent solution for restoring natural hairlines. See more photos of the results of this surgery. 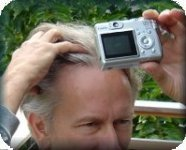 This entry was posted in Baldness, Hair Loss, Hair Transplant on October 6, 2009 by Larry Shapiro.